Best Cinnamon Extract + CinSulin 60 caps. Take 2 capsules a day with meal, or as directed by your doctor. This supplement is intended mainly for people who want to prevent the type 2 diabetes and other cardiovascular system diseases. It is also recommended for those, who do not tolerate high amount of carbohydrates in their diet and want to improve tissues insulin sensitivity. 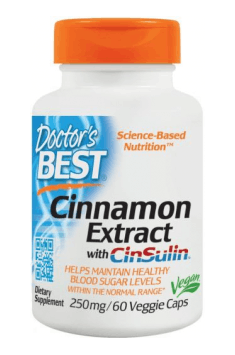 The recommended dose of cinnamon for antidiabetic purposes is about 1-6 g per day, however if there are no desirable effects, this amount can be increased. To achieve the best results, this supplement should be taken with food containing carbohydrates. Advanced vitamin B complex with methylated forms of folic acid and cobalamin.